Kimbe Bay – There are many outstanding dive sites in Kimbe Bay. To be exact, there are more than 190 reefs. All dives in this part of the world are exceptionally good. Kimbe Bay highlights include scalloped hammerhead shark, grey reef shark, white-tip reef shark, barracuda, and dolphin encounters. Moreover, Kimbe is celebrated for its colorful soft corals, fans and other wide-angle scenery. Other signature dive sites include a fully intact Japanese Zero fighter plane, and picturesque Restorf Island, where the scenery is equally good above and below the surface. A resident giant barracuda and some black tip reef sharks populate healthy reefs that have good split shot, wide angle, and macro opportunities. Garove Island – This island, about 60km northwest of Kimbe Bay, was a large volcano in the past. The crater is now flooded with water (approx. 300 meters deep) and makes for some great diving around the island that was created within the volcano’s caldera. The land- and seascape are absolutely stunning! You are in for big fish like barracudas, trevally, large dogtooth tuna, Spanish mackerel and sharks. It is famous for schooling fish and loads of soft corals as well as unusual critters. While less reliable than the reef dwellers, various marine mammals also make a regular appearance here, including pilot whales and several species of dolphin. To top it off, orcas and sperm whales occasionally make an appearance. Be always on the lookout for octopus, ribbon eels, mantis shrimp, and many a species of anemone fish. Krakafat – Similar to other sites in the area there are schools of batfish, barracuda, and jacks. However, the quantity and density of the fish at Krakafat are unparalleled. Opportunities abound to get photos of soft corals with schooling fish in the background and photos of laid-back batfish. 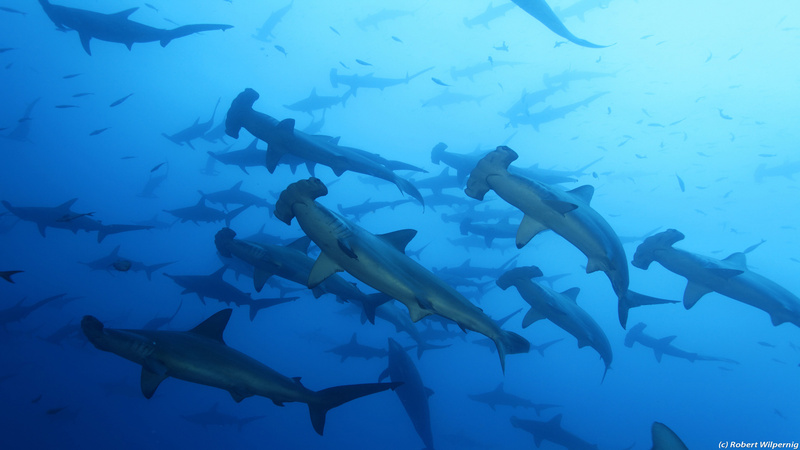 Keep your eyes out for reef cruising sharks and tunas. 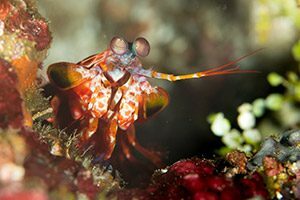 Wire Bay – This is a great macro site where you might find seahorses, ghost pipefish, shrimp, “nemo” fish, and an assortment of other critters. Waterfall Bay – Coral bommies and white sand slopes with a great assortment of nudibranchs and flatworms, soft coral cowries, squat lobsters, pipefish, upside-down jellyfish, as well as a myriad of small crabs and shrimp plus a couple of octopus and cuttlefish. Jacquinot Bay – Very little is known about diving here, which is the best and most exciting part of this itinerary for the adventurous diver. Let’s explore! Linden Harbor/Lindenhafen – Mainly muck diving on a silty sand slope, where you can see ornate ghost pipefish everywhere. This area is great for critters such as snake eels, dragonets, pipe fish, frogfish, orangutan crabs, blue boxer shrimp, quill worms, plus lots of unusual nudibranchs. In addition to muck diving, there are a couple of gorgeous walls where eagle rays, sharks, bumphead parrotfish and barracuda can be spotted. We will do some exploratory diving to seaplane wrecks as Linden Harbour housed a Japanese air naval base. There are a couple of wrecks: a Jake floatplane, parts of an Oscar plane, a Pete biplane and another blown apart. The Jake is a beautiful and easy dive in just 18m of water. Tavalo – Another remote and undiscovered diving area. Most likely, you will find hard coral walls and slopes. Chance of spotting big wahoos, turtles, cuttlefish, longnose hawk fish, squat lobsters, jaw fish, batfish, flying gurnards, eels, porcelain crabs, clownfish, nudibranchs, and ghost pipefish. Departing from Kavieng on New Ireland, this itinerary covers the best diving in this region that will certainly blow you away. 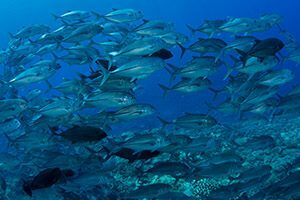 Chapman’s Reef on Ao Island – This reef is an incredible drop-off with huge schools of barracudas, tunas, grey reef sharks and Queensland groupers. There can be strong currents, which is when the action happens, but visibility is usually very good. Three Island Harbour – Kavieng used to be a major Japanese naval base during WWII. After the US bombed this base in 1944, a convoy of Japanese vessels coming to the rescue was also attacked. They managed to destroy 3 ships at Three Island Harbour: Sanku Maru, a Type C midget submarine, and Subchaser # 39. Sanku Maru is resting on her starboard side in 22 metres of water, less than 50 apart from the midget submarine. The Subchaser lies nearby, between 2-14 metres depth. All wrecks are fully overgrown with corals and house plenty of marine life. Furthermore, we plan to dive around the islands of Tsalui, Tsoilaunung and Selapiu, which are so infrequently visited that there is an interesting exploratory side to the diving here. Kavieng – This area has a huge variety of marine life. There are fantastic pristine coral gardens, sponges, many different species of nudibranchs and tropical fish. This is a great place for “macro” diving and to see big pelagic species at some of the PNG signature dive sites. When the currents are strong, eagle rays, mobula rays, big dogtooth tunas, barracudas, plenty of grey reef sharks and loads of other fish can be seen here. Divers should be more experienced in general and like to dive in currents in order to do and enjoy those exciting dives. There are also some great World War II wrecks in the harbour, such as the wreck of an Aichi E13 “Jake” floatplane. The Japanese used this seaplane for reconnaissance purposes. Albatross Channel – Minutes away from Kavieng, on the West Coast, there is a narrow passage between two islands. A ridge runs across the mouth of the passage at 9m (30 ft). Diving from the top of the ridge down to a sandy plateau at 27-43m (80-130 ft) where numerous pelagic fish congregate in the channel and a large number of grey reef sharks cruise along the mouth. Mantas and mobula rays are frequent visitors. On top of this is a magnificent wall of soft coral. Average visibility is around 30-35 metres (100 ft). Look in the soft corals for leaf scorpionfish and pygmy seahorses. Yes, I enjoyed the trip! Learned heaps. Saw lots. But I was also extremely impressed by the professionalism and teamwork involved by all of the crew as well as the obvious leaders. And so helpful! Thank you!! Such an awesome trip, I’ve loved everything you’ve pointed out and seen and done. Both Adam and Carmen have helped so much with techniques, identification and overall enjoyment factor. Wildlife is amazing – even the triggerfish and it’s a delight to see two people helping others enjoy what they love so much. Will stay with me for life. Big Love! Thanks to Carmen and Adam and all the crew for a great trip. Thank you to Carmen, Adam and the whole Solomons PNG Master crew for the amazing experience. The last 10 days have been absolutely amazing and far exceeded my wildest expectations of what Solomon Islands diving would be. Again, a big thank you to Carmen and Adam who are a true asset to Master Liveaboards. You both made my trip! Felt very welcome from the moment we stepped on board. Special thanks to Adam and Carmen, our beautiful nudi queen!! A wonderful trip especially our memorable encounter with the crocodile!! Thank you to all the Solomons PNG Master crew for a great diving holiday. Loved it, love it, loved it!! Fantastic dive sites, breathtaking swim throughs and caverns, large schools of sharks, trevally and bumpheads!!! The staff and crew were the ones that made the trip. Very professional and I appreciated attention to safety. Trip was incredible we have made new dive friends from all over the world. You could not ask for more from such a lovely totally fantastic staff. Very skilled and caring operators always waiting to assist in every way. Very much appreciated by me being nearly 74 years old !! A truly great bunch of very lovely people. All the crew members were outstanding in their friendliness. Without exception they made an effort to be sociable, caring and helpful. My guides were exemplary in their attentiveness and at all times I felt cared for. Crew were amazing as was the food. Comfy boat, and lovely room. Love the focus on eliminating plastic. Great food, yum yum yum.. Need to diet for a month now. Vegetarian options were awesome too. Really amazing and so caring! We highly appreciated having them around with us at the dinner table and sharing stories and learning about their culture. Also visiting their villages and having a guided tour by them was very special. It was so great to meet them and see how kind they all were.. It really made a big difference in my trip. Belinda, the cruise director, was also exceptional and her management skills are second to none. Tt was just amazing! We loved it from the start to the end... and we are so sad to leave as usual... See you very soon!! The crew are incredible and work tirelessly to ensure everything is perfect. Excellent people who put the extra effort to make us feel great. They deserve all the credit for the success of this expedition to Russells, Mary and Florida island in Solomon. The best staff I have ever met. Very very much exceeded my expectation. The best liveaboard trip of my life. A truly professionally run dive boat. The crew were fantastic, the dive sites stunning and wee little touches like sweeties on the pillow and a warm towel after each dive really added to the whole experience. But no doubt in my mind that the energy, enthusiasm, kindness and knowledge of Adam and Carmen totally made the trip for me. Thank you so much and hope to see you again sometime. I feel enriched! Siren and Master liveaboards are by far the best liveaboards I've experienced. Cruise director was terrific. Very passionate about her job and the diving experience. Crew were a lot of fun, great to be with. Would definitely cruise with them again. © Copyright 2015 Master Liveaboards. All Rights Reserved.